Across the country, NSPE members made 2018 a year of change. It was a year dedicated to unifying and strengthening the nationwide network of 52 state and territorial societies that stands for licensed professional engineers and their protection of the public health, safety, and welfare. Working together, the network helped champion the PE cause, advance the careers of PEs and those on the path to licensure, unite a diverse profession, and promote the outstanding contributions of professional engineers. The PE license doesn’t come easy. Once earned, it’s a distinguishing mark in an engineer’s career that signals a commitment to protecting the public health, safety, and welfare as well as the ability to take on higher levels of responsibility. PEs well know, however, that the role of the license can be threatened, misunderstood, or minimized by those outside the profession. When you want to be sure someone is looking out for your interests and the license you worked so hard for, NSPE’s national network has you covered. A professional engineer’s career success is built on a range of capabilities: foundational skills, like math and science; technical skills, covering areas like design and safety; and professional practice skills, like communication and ethical responsibility. The NSPE national network is your resource for lifelong learning and development. 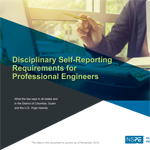 When you want to advance in your career and build your professional reputation, NSPE is there to help. NSPE members come from different engineering disciplines, different practice areas, different parts of the country, and different age groups. But all are dedicated to licensure, professionalism, and protection of the public. NSPE’s national network brings together this diverse group and creates a community that provides mutual support in a fast-changing society and profession. One thing NSPE members have in common: Pride. Whether building a legacy for the profession, showing the next generation the excitement of engineering, or honoring the accomplishments of colleagues, the NSPE network gives professional engineers a national outlet to show their pride.